After returning from working in an economic commission in Zimbabwe, Peter Harris was interviewed by the Public Service Association Journal of September 1980. He had this to say about Zimbabwean President, Robert Mugabe. "So far I think it has been managed very well and I think Mugabe is an enormously impressive person. He's done very well to avoid the factionalism that could easily have broken out after so many years during which the whites played off groups of the people against each other"
Yeah, but wasn't that actually true of Mugabe when he first took over? It wasn't until the mid 1980s that his despotism came out and he ditched his previous tolerant style of leadership. I don't think you can apply Harris' post 1980 election comments against the actions of Mugabe post 2000. How long before we see Harris with his own show on Radio NZ? Aaron was an open Marxist-Leninist who gained power by voilence. In very quick time Mugabe began killing his (black) enemies. It was only when he started on white farmers that the world took notice. All this was completely predictable. Harris should be taken to task for his idiocy, just as those who praised Pol Pot, before his crimes became widely known should be. Was I? I presume you missed out ", Mugabe...." after my name. But the point still remains that Wikipedia, at least, describes the 1980 election and situation in Zimbabwe as relatively stable until 1983. That would have made Harris' comments at least relevant to the election in 1980. Hehehe Aaron, Trevor will out you as a Marxist-Leninist revolutionary from Sierra Leone at some point - but seriously, Trevor is right. Mugabe's brutality goes back to the founding of Zimbabwe - he created the North Korean trained Fifth Brigade, known for its brutality against Mugabe's opponents. Mugabe's ZANLA had delightful tactics such as bayoneting infants in their mothers' arms when taking over villages or in response to villagers who opposed them. 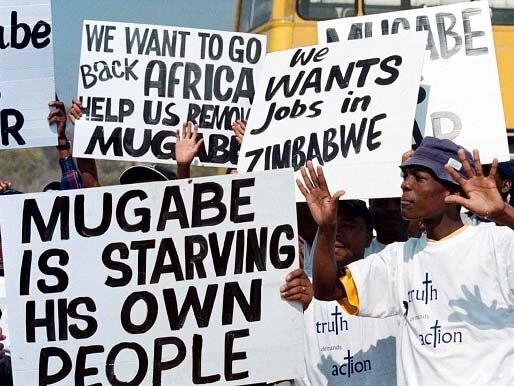 Mugabe has been a Marxist-Leninist thug from the start and it is only the blinkers of the left that have ignored he - he was always committed to creating a one-party state and said so publicly. Dump This Dodgy Deal Mayor Moore.